This page is general advice only. For specific guitar recommendations, check this page. Consider renting. While renting does not make much sense financially (especially in the long-term), it can give you some time with an instrument at home to decide if you like it. Beware of cheap instruments. Some guitars are so awful, even a master guitar player could not make them sound good—so do really expect that you can? If you do not start with a good instrument, you will sabotage your learning efforts. Spend as much as you can afford. It’s very difficult to find an acceptable guitar that costs less than $300. Relax—it’s an investment. The money doesn’t go down the drain. You can always sell the instrument later. Guitars tend to hold most of their value if well cared-for. Does it feel good to play? Guitars range from “easy to play” all the way to “impossible to play”. As a beginner, you want to get one that’s as easy as possible. If you can, ask your teacher or a friend to help you find one that’s easy to play. Does it sound good? You will be more inspired to play if your guitar sounds good. Have someone demonstrate it for you. But don’t listen to their playing; try to listen to the overall sound of the guitar. The best thing is to have someone play the same thing on multiple guitars. Do your own research. Although they have good intentions, salespeople are often asked for recommendations. 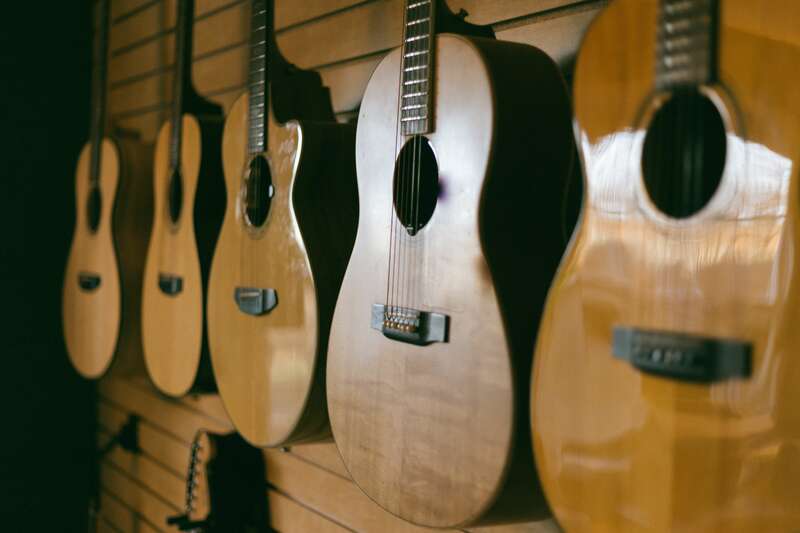 The act of recommending a guitar is tiring and few first-time buyers can give a guitar salesperson enough information to make a good recommendation. Do your own research first. If you still aren’t sure, then you can get whichever guitar the store recommends. Set the highest price range you can afford: $500, $750, or even $1500. Have someone demonstrate the guitar. Does it sound good? Ask someone to play it. Do they think it is “easy” and “playable”? Play a note. Does it feel easy and comfortable? Is the size and shape right? Can you spend an hour holding it? Does the instrument appeal to you, and excite you? Mandatory accessories: every student must have some guitar picks, a guitar tuner and a guitar metronome. Both tuner and metronome can be downloaded for smartphone. Important accessories: a music stand, a strap, a simple folding chair. A soft bag with shoulder strap for carrying the guitar, and an extra set of strings. Optional accessories: most other accessories are optional. These include but are not limited to: a physical tuner or physical metronome, a capo, guitar learning books, guitar paper, etc.